The Iowa trustee's deed is a form of conveyance used to move real property out of a trust. Generally, the trustee's deed is named for the person executing the document, rather than for the warranties of title contained within. In Iowa, however, trustee's deeds carry certain covenants that, when paired with an affidavit of trustee under Iowa Code 614.14, secure the purchaser against adverse claims. 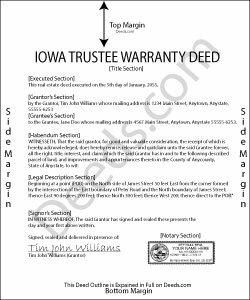 Because of this, Iowa's trustee's deeds are often labelled "Trustee's Warranty Deed." The trustee is the person designated in the trust instrument as the trust's administrator. The trust instrument is executed by the settlor, who, in addition to setting out the provisions of the trust, funds the trust with assets, which may include real estate. The trust instrument also identifies the trust's beneficiaries, who will receive income from the trust and/or trust property after the settlor's death. In a trustee's deed, the trustee fulfills the role of the grantor. The deed provides the name and date of the trust under which the trustee is acting, and references the prior deed under which the trustee was granted title to the property. As with other instruments affecting real property, the trustee's deed recites the legal description of the real estate being transferred. Pursuant to Iowa Code 614.14(4), unless a contrary provision is clearly stated, a trustee transferring an interest in real estate warrants that the trust on behalf of which the trustee is acting is duly executed and in existence; that, to the knowledge of the trustee, the settlor was under no disability or infirmity at the time the trust was created; that the transfer by the trustee to the purchaser is effective and rightful; and the trustee has no knowledge of facts or legal claims which might impair the validity of the trust or the validity of the transfer. These recitations are made in the text of the deed. All acting trustees must sign the deed in the presence of a notary public for a valid transfer. The deed is then recorded in the county in which the real property is located. Additional documentation, such as a certification of trust or affidavits of trustee and purchaser may be required for the transaction. Consult a lawyer with questions about trustee's deeds, as each situation is unique.